The “pop-up restaurant” is not a new phenomenon. That being said, there are only a handful out that there that focus on creating beautiful innovative dishes out of bizarre foraged ingredients. The Chez Jose Experience is all about speed. I imagine after reading that you are thinking quickness but actually Jose is much more interested in slowing things down and simplifying the relationships between the food, the chef and the diners. What results from this experiment?… A more intimate and educational dinner where you can expect to be opened up to another world of food and creativity while having memorable conversation with the fabulously clever diners seated around you. Intrigued yet? Jose Ramirez-Ruiz & Pamela Yung are a young talented team that delivers a powerful one two punch. Jose Focuses on the savory dishes and Pam works her magic on the pastry side. 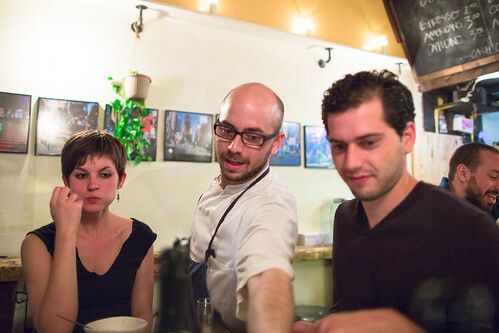 Both chefs are veterans of the restaurant scene. Jose Ramirez has worked at some of the premiere dining destinations…Clio- Boston, Per Se, Brooklyn Fare and El Celler de Can Roca (spain). The Lovely Pam’s background is up there as well: Roberta’s, Torrissi and Isa. Together this is a match made in flavor heaven. Last time there (the second week they started) we had the pleasure of trying some very unusual ingredients: 01. Lily-like flower blossom, 02. A very untraditional pasta 03. Sunchokes and a few very special items we feature in our anatomy of taste section below. This dish looked like a piece of art. The onions were Foraged in upstate NY by a fellow diner sitting next to us. We heard many wonderful stories about his passion for foraging and how he got into it. All quite fascinating! I am a huge fan of rhubarb and loved what Pam did with this dish. The use of sliced raw almonds and Buckwheat created a fantastic array of unusual textures. If you are really into food and enjoy learning and meeting cool people, I highly suggest you head to Brooklyn, bring some wine( or whatever spirit you like) and let Jose and Pam do the rest. Trust me you are in the hands of two game changing chefs. I promise you will not be disappointed! BTW there are some rumors that Pam is starting a bread CSA. If you love carbs of the artisinal kind I suggest you get in on the action.